Mirfield Town booked their place in a second cup semi-final in as many weeks as they completed a quickfire double over AFC Chickenley. Mirfield followed up their success in the Brook Butler Cup the previous week with a 6-4 victory over Chickenley in the Heavy Woollen Challenge Cup last Sunday. Town progressed to a second semi thanks to doubles from Gibril Bojang and Adam Brown, plus strikes from Callum Firth and Harry Stead. They will play either Wellington Westgate or Clifton Rangers, who were unable to play due to an unfit pitch. The other semi-final will see Huddersfield sides Linthwaite and Premier Division leaders Walkers Hounds clash. Linthwaite won their quarter-final 7-2 away to Deighton WMC, while Hounds beat Roberttown Rovers 5-2. Town will look to make it a hat-trick of cup successes this Sunday when they are one of six Heavy Woollen sides involved in the West Riding County Cup. Battyeford enjoyed a 5-0 win over Inter Batley in the Heavy Woollen Challenge Trophy thanks to a brace from Nigel Saddington plus strikes from Matt Windall, Josh Auty and Peter Glover. They will play Snowdon, who earned an impressive 4-3 victory against Championship title challenges Mount Pleasant. Clifton Rangers Reserves are also through to the semi-final after they won 3-2 at Wire Works, who scored through Dom Harris and Nolan St Hilaire. In the only Championship game to take place, Corey Joshua netted for Ravenswharfe but they lost 4-1 against Clifton Rangers Athletic. n Mirfield Old Bank WMC are enjoying life in the Wakefield Sunday League following their switch from the Heavy Woollen League at the start of this season and are currently top of Premiership Two. 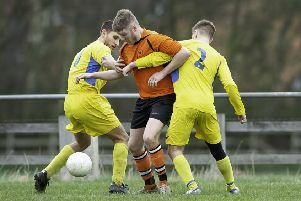 Their latest success saw Old Bank defeat AFC Ackworth 8-3 in what proved a memorable day for Bobby Evans, as he scored seven of the side’s eight goals. Evans is having a superb season and has already scored 37 goals in his side’s 15 games and Old Bank are level at the top with Rocking Horse.